Detailing over 100 sound absorbing materials and finishes with case studies of innovative architectural and design applications. 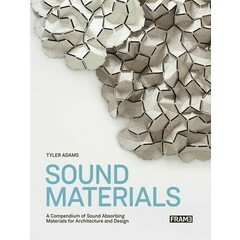 Sound Materials is a definitive resource for architects, designers, acousticians, engineers, students and creative professionals – the first publication of its kind to catalogue over 100 sound absorbing materials, detailing inspiring real-world applications. Project profiles include work from leading architects and designers such as OMA, Gehry Partners, Foster + Partners, Ronan and Erwan Bouroullec, and Barber & Osgerby. These projects showcase sound absorbing materials in a variety of interior design and architectural contexts and underscore some of the common acoustical and material challenges presented by specific applications, such as healthcare, education, performing arts, office, retail and industrial environments. Fundamental technical concepts are clearly presented to offer readers with an understanding of how materials absorb sound and how these materials are commonly used to reduce noise and reverberation, inform our sense of space, and improve communication in everyday environments. This book not only surveys an extensive range of materials past, present and emerging, but also highlights many exciting opportunities for future innovation and collaboration at the intersections of acoustical engineering, materials science, design and architecture. A special chapter is devoted to interviews with designers and engineers who work with sound absorbing materials in novel and innovative ways, covering topics such as historic preservation, wayfinding for the blind, digital modelling and fabrication, interior design, and emerging high-tech materials. Tyler Adams is an acoustical engineer based in Los Angeles, California. He holds a Master of Science in Architectural Acoustics from Rensselaer Polytechnic Institute and is a member of the Acoustical Society of America and the Institute of Noise Control Engineers. As an acoustician, he has consulted on a variety of projects, including schools, hospitals, offices, high-rise buildings, research laboratories, performance spaces and environmental noise. 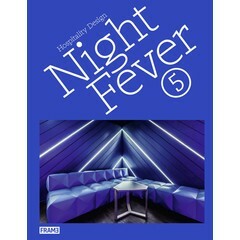 This title is a new addition to Frame’s portfolio of books covering innovative materials for architecture and design applications. A reference book intended to be a resource and archive that readers will want to regularly access and refer to throughout their careers. Detailed descriptions of over 100 fascinating sound-absorbing materials – past, present and emerging – and their applications in interior design, product design and architecture. The materials and their inspiring real-world applications are investigated, showcased through reference projects by leading architects and designers, including Barber & Osgerby, Foster + Partners, Gehry Partners, OMA, and Ronan and Erwan Bouroullec. The material descriptions strike a balance so as to speak to as broad of an audience as possible yet still appeal to a seasoned professional, such as an acoustical engineer, or serve as an educational resource for a college course. 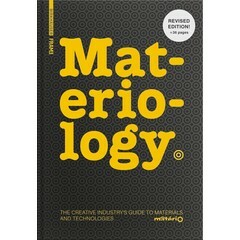 Numerous interviews are included with designers, material scientists and engineers, exploring how materials are created and utilised to solve design problems. An extensive index at the back of the book with an alphabetic listing of materials. Vital reading for architects, designers, acousticians, engineers, students and creative professionals. Outstanding graphic design and full-colour photography. Promotion of the title continuing across the globe in 2017! A very complete and up to date catalogue of sound absorbing materials. Well documented and illustrated: a must-have for every architect and acoustician!